By 1970, the population had increased so much, the school had to add ten portables until additional wings were built. It was the “disco” era. The Electric Crow Disco Dance was the name of a student dance. Girls had long straight hair. They also started wearing pants to school. Lots of students had haircuts with bangs. The P.E. strip was black shorts and white tops. Students had a club for golf, bowling, wrestling and juvenile soccer, as well as a ski, scuba and cycling club and a hair cut club! There were exciting indoor track meets. Yearbook photos included the students’ phone numbers and addresses! Students liked to doodle and some had their thumbprints with their autographs in yearbooks. Advertisements for food and car repair helped pay for publishing costs. 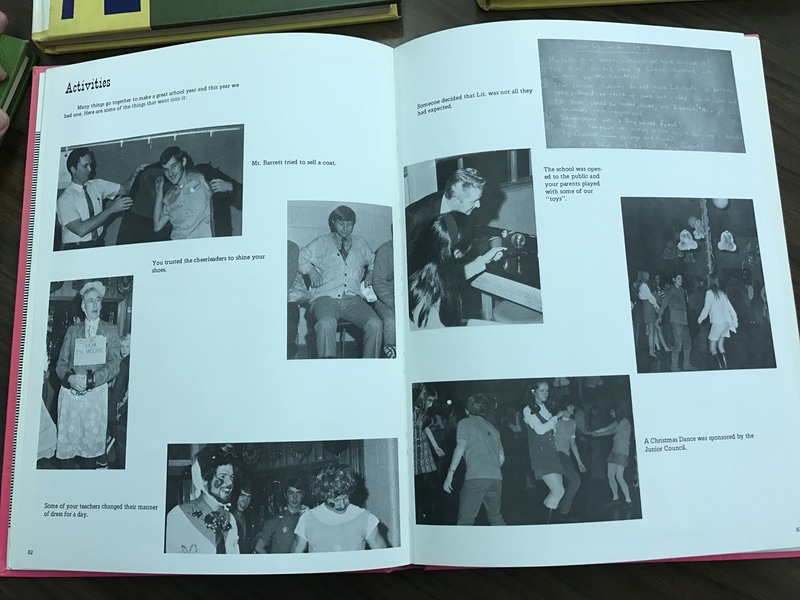 The yearbooks also show photographs of “student couples” walking around the school. Students walked to school usually because they lived nearby (unlike today) and there was limited public transit. Langara Community College, which started in 1965, moved to its current location on 49th Avenue in 1970. Many Killarney grads have attended Langara. In 1973, Champlain Mall opened with 32 stores, including Kinney Shoes, Kits Cameras and Glenn’s Records and Tapes. The Chilean Housing Co-op at School and Tyne was built to house political refugees after Chile experienced a bloody political coup against its democratically elected government on September 11, 1973. Killarney teachers who were students here in the 1970s and 1980s said they enjoyed going to Killarney and had lots of friends. They remember having classmates who became famous too. Ms. Mohan is one of these teachers. She was anxious when she first went to Killarney and remembers some students played tricks in the hallway. She also remembers the school was not as diverse as it is now. The sense of community has stayed the same, she believes, and Killarney makes you feel like you have a place to belong. Ms. Mohan remembers lots of fun activities like dancing, skiing, tackle football and live bands. According to another Killarney teacher, Ms. Schwab, who was also a student here in the 1970s, boys got into more physical fights. Also students had to work much harder than they do today to get an “A.” There were not too many “second chances” for students who broke the rules either. It was a blue-collar neighbourhood back then, Ms. Schwab says, and housing was much more affordable. She recalls different classmates who went on to become a heart surgeon, accountant and engineer. By the 1980s, more students were enrolling in the school who came from diverse racial backgrounds. Many Vietnamese refugees, escaping decades of war, came here. Known as the “boat people,” they have many businesses in shops along Kingsway. There were more extra-curricular activities and the music and drama departments were very active. The Wizard of Oz was performed one year. Judy Wright was Killarney’s very own super swimmer. There was boxing at school—even though the boxing gloves were in bad condition. There was a broadcasting and rope-climbing club too. Here’s what teachers who went to Killarney back in the 1980s and 90s have to say: Ms. Semail remembers there were lots of sports clubs when she went to Killarney—and a great school spirit. Mr. Chen Henry “loved” Killarney and his favourite teacher was Mr. Wood, who taught math. He says Killarney is always welcoming every student. Ms. Wong said her school days were a “good experience.” She said the school spirit was strong, especially in sports. Ms. Nijad says lots of things have stayed the same, like the sports, music and drama programs. To her the tradition of Killarney is its diversity. Ms. Mahovlich enjoyed her time at Killarney as a student too. “It was really a good opportunity to meet lots of different people,” she says. She notices students are still passionate about learning and volunteering. Mr. Kachmar remembers school was fun and says he made lots of friends. He says the school has always been a welcoming place.